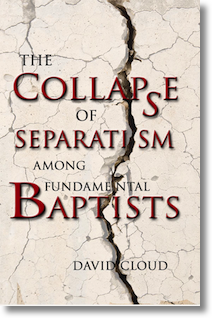 This book is about the collapse of biblical separation within the fundamental Baptist movement, the causes of this collapse, and how to avoid it at the local church level. We document the collapse within the GARBC, ABWE, Thomas Road Baptist Church and Liberty Baptist College, BBFI, Southwide Baptist Fellowship, Tennessee Temple, Calvary Baptist Seminary, Cedarville University, plus other churches. We document the spiritually-treacherous waters of evangelicalism today and warn about “conservative” evangelicals who act as bridge builders between “fundamentalists” and evangelicalism, such as Ed Stetzer and John Piper. We warn about the soft separatism that is practiced by many professing fundamentalist preachers and that is ineffectual to protect the churches. We document 21 examples of the heresies and fables that are found in evangelicalism today, including the smorgasbord of modern Bible versions, process salvation, ecumenism and affiliation with Rome, cultural liberalism, Christian homosexuality, the downgrade of hell, theistic evolution, charismaticism, contemplative mysticism, self-esteemism, and The Shack and other false gods and goddesses.